Cut large artichoke hearts lengthwise into halves. 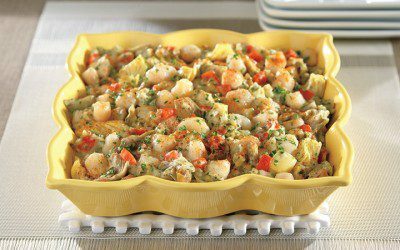 Arrange artichoke hearts in even layer in 8-inch square baking dish. Rinse scallops; pat dry with paper towel. If scallops are large, cut into halves. Arrange scallops evenly over artichokes. Heat oil in medium saucepan over medium-low heat. Add bell pepper and green onions; cook and stir 5 minutes or until tender. Stir in flour. Gradually stir in milk until smooth. Add tarragon, salt, and white pepper; cook and stir over medium heat 10 minutes or until sauce boils and thickens. Pour sauce over scallops. Bake, uncovered, 25 minutes or until bubbling and scallops are opaque. Sprinkle with parsley and paprika before serving. Tip: White pepper is a mild version of the common black pepper. They both originate from the same berries, which are called peppercorns. White pepper helps to maintain consistent color in light foods. Exchanges per serving: 2 Vegetable, 2 1/2 Meat, 1/2 Milk.